Sean Yeager books are written to inspire and excite readers. I often hear feedback from parents and I ask what their child likes and ‘why?’ Here are some highlights. If you are considering buying a present for a child in your life (8 to 15) take a look at a free sample of the first chapters: DNA Thief and Hunters Hunted . 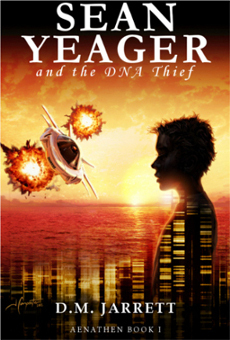 Mike: My son raved about the DNA Thief, he said it was the best book he’s read. He loved the action and insisted on writing his own Amazon review. He’s quite selective about what he reads and he took his time reading it because he didn’t want to miss anything. I was taken aback, we’ll buy the second book as a special present. Alison: Our son was up until late reading DNA Thief and he wouldn’t put it down. He finished the book within two days. He says it’s his second favourite to Percy Jackson. He loves all the gear and gizmos. He asked if there can be more machines and gear in the next book? He wants to know what happens next. Anne: My son read both books from cover to cover in a few days. He’s now read it twice and raves about the characters. He’s been designing pictures of craft and bases inspired by the book. He can’t wait to read the third book. He’s asked if there can be more jokes and lots of incidents. He loves the characters and wants to know more about what happens next. It is sci-fi and an action thriller rolled into one, and centres on Sean Yeager, who believes he is fairly ordinary until a burglary at his home reveals he is anything but. The boy is spirited away by a protector he didn’t know he had – The Foundation. From there the plot unravels at terrific speed, and reveals secrets about Sean’s Dad and his own status. My only comment would be that the title and cover graphics might not be as enticing to kids as they should be – this book deserves to be read! The other character names, such as Major Clavity and Greerbo – are certainly spot on. Wishing you a great holiday season and a Happy New Year! I’ll be busy preparing for the celebrations, while finding time to develop book 3 Claws of Time which is now plotted and in progress. There are so many ideas I’m struggling to fit them all in! This entry was posted in action book, adventure book, adventure books, book series, books, child carers, children's book, children's learning, family, grand parents, grandparents, inspiration, inspiring children, james bond, middle grade, moms, mums, parenting, parenting boys, reading, sean yeager adventures, star wars, teachers, teen read, tween read, writing, writing for boys, young adult, young fiction and tagged action book, adventure book, book for boys, book series, books for boys, boys reading, child carers, children's book, children's book series, children's series, encourage reading, family, grand parents, inspiration, james bond, middle grade, moms, mums, parenting, parenting boys, parents, present, rainy day, reading for boys, sci-f films, sci-fi, star wars, young adult on December 13, 2015 by D.M. Jarrett. It all began on a foggy Saturday morning one autumn. I was driving my son to a football match along a winding country road. The fog was so thick we could hardly see the next bend, let alone the trees standing silently on either verge. Fortunately, the traffic was light and there were no wild deer wandering around. It seemed so surreal and closed-in that it made me feel like we were completely alone in the world. Two explorers on an empty trail. ‘Wouldn’t it be funny if we were kidnapped by aliens?’ I joked. My son laughed and asked me what kind of spaceship they had. I invented a story as we drove along. It was a bit corny and very Close Encounters, but my son loved it. A huge ship with bright lights levitated our whole car into the sky, swallowed us whole and sped away into space. ‘And then what happened?’ asked my son. We arrived a little late for the football match and I think the result was a hard-fought draw. On the way home my son again asked about the aliens. Over the next few days he asked for more details, which I dutifully made up on the spot. And he drew pictures of the aliens, their home world and their ship. The mushroom headed aliens from the orange planet had been discovered! As a surprise, I wrote a short story about an elaborated version of the adventure and printed it out, My son was only 5 years old and it seemed like a great way to encourage his reading. Sure enough, he read the twenty page story several times over and asked for more. He continued to request more information about the aliens and wandered around the living home inventing elaborate details. He invented their home world, their food, how they communicated and where they lived. A creative professor was appointed. We still talk about that first story to this day. I have the printout tucked away in a folder somewhere. Over the following months I wrote several other short stories. A fairytale, a mystery and a spy story. Each was studied and my son acted as editor and critic. He was honest and articulate. We also shared the stories with one of his closest friends. Two of the stories stood out for them. The aliens and spies. They enthused about them and developed intricate details of the gear they used and how they outdid their enemies. It dawned on me that these two boys enjoyed nothing better than reading about gizmos, gear, ships and of course adventures. Fast forwards several years, I am in the process of plotting Sean Yeager books 3, 4 and 5. My son, now 10, introduces inspired ideas. Sometimes accidentally, often with great precision and deep thought. He is the self-appointed ‘chief designer’. If a craft or building is referred to in a scene he designs it. Factions, tactics and missions are declared regularly with requests to talk about the ‘Golden Era’ or the ‘Foundation Commandos’. A timeline was invented pitching the first two books firmly in the middle of an epic saga. So far so Star Wars and yet not at all. We are both fans of James Bond, Star Wars and numerous films and characters. Monty Python and Johnny English for example. With a twist. Many are the times we debate where all the Stormtroopers have suddenly arrived from and why they can’t hit a barn door at five paces? Austin Powers is another favourite for making fun of the baddies and their huge private armies. We are convinced that every base must be wired with self destruct devices from day one. Without giving away plot spoilers, it is true to say that my son has now inspired at least three major plot points in book 3 and most of the outline plot for book 4. Book 1 was drawn in part from two early short stories, while book 2 was I have to say mostly my own creation to surprise and stretch the genre. I have long since decided to stretch the SY world as far and deep as I can. With some humour and plot twists thrown in for good measure. The back story is about spies and two factions attempting to defeat each other and leave Earth. Hence the tagline James Bond meets Star Wars. Of course Sean Yeager Adventures are also original with a flavour of their own. In the Sean Yeager world nothing is what it seems. For a start it is superficially just like the town you live in. Things break and go wrong. There are no massive armies or heroes who survive certain death for implausible reasons. You see, none of these plot angles would survive my number one muse and critic. And I find that the confines of constraint are far richer veins to explore than heroes and enemies with infinite resources. Perhaps those are variations on the ‘unstoppable force and immovable object paradox’? Or the similar ‘slap shot syndrome’. Looking ahead, I am pleased to have entertained my son and his friends. Long may it continue. They have pretty much demanded book 3 with helpful hints such as: ‘more gear and vehicles please’. They have role played the heroes and villains and taken them far further than the existing plot lines. Lego ships and paper drawings abound. We once made Kimbleton Hall in plan view out of basic Lego bricks. It was great fun. Book 3 is overdue and the plot is already well-defined. All that remains is the many hours of writing, refining and editing. LOL. It seems that inspiration is circular, from author to readers and around again. From father to son and now son to father. One day who knows we may be watching a Sean Yeager film together and debating the finer points scene by scene. Now that would be fun. Make this into a movie now! This entry was posted in adventure books, book series, children's book, inspiration, inspiring children, james bond, middle grade, moms, mums, parenting, parenting boys, reading, sean yeager adventures, star wars, teen read, tween read, writing, writing for boys, young adult, young fiction and tagged action book, book for boys, book series, books for boys, boys reading, children's book, children's book series, children's series, encourage reading, father and son, inspiration, james bond, middle grade, reading for boys, star wars, young adult on September 26, 2015 by D.M. Jarrett.